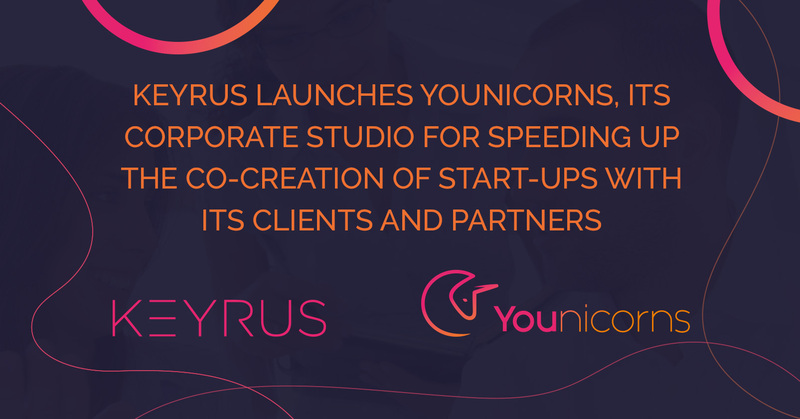 Keyrus, an international specialist in Data Intelligence, Digital, and Consulting on the Management and Transformation of enterprises, announces the launch of Younicorns, its Corporate Studio, dedicated to designing and fast-tracking projects to co-create start-ups in active collaboration with major brands. The aim is to enable the brands to better connect with their market, and thus react more swiftly to their customers' expectations in terms of developing products and their uses. The initiative to establish Younicorns was born out of a twofold observation on the state of the market. This observation highlighted, on the one hand, the boom in start-ups with heightened innovation in their DNA, and, on the other hand, the major disinclination of large companies to innovate, and the necessity for them to reinvent their business models to enhance their agility and meet their customers' expectations more effectively in this digital age. So as to get its Corporate Studio launched and deployed quickly, Keyrus called upon two experts in co-creation, Jonathan Horyn and Brahim Abdesslam, who are both equity partners in Younicorns, as part of an employee intrapreneurship initiative within the Keyrus Group. Jonathan Horyn possesses sound expertise in areas related to Data, the Blockchain, AI, and Robotic Process Automation (RPA), with more than ten years' experience in Finance and Insurance business functions. As for Brahim Abdesslam, who is a serial entrepreneur, he has over ten years' experience in digital transformation and customer innovation. "We do not stop at conceptualizing innovation, but rather strive, above all, to implement that innovation in a pragmatic way, with companies seeking to renew their business models, or disrupt their markets. How do we do this? By helping them turn their ideas into reality and transform them into innovative products and services", explains Brahim Abdesslam, Co-Founder of Younicorns. "We have thus decided to develop the way brands approach innovation and work with start-ups, so as to achieve faster and more tangible results. By joining forces with the large companies, we commit to these start-up co-creation projects facing the same pressures to succeed as the companies themselves do". Younicorns is aimed primarily at major companies (CAC 40, large companies, intermediate-sized enterprises…), but also at start-ups that have already raised funds, regardless of the sector. It is now commencing its activities in France, but will soon be extending them to the fifteen or so countries in which the Keyrus Group is present. Younicorns intends to co-create a 1st start-up in just the next few months, and aims to increase its co-creation projects by taking swift advantage of the experience gained and building on its portfolio of assets (algorithms, technological frameworks, tried-and-tested methodologies,…) that can be re-used for the benefit of new projects. "In launching Younicorns, Keyrus demonstrates its ability to reinvent itself by creating fresh business models and providing its clients with a new value proposal. Younicorns also allows our Group to equip itself with experts in the strategic areas of the Blockchain, Cryptocurrencies, Data Science, and Growth Hacking, to name but a few", comments Eric Cohen, Founder, President & CEO of Keyrus. "This creation is entirely in keeping with Keyrus's DNA, which is all about anticipating new market trends and finding ways of testing new disruptive initiatives."